This customer was noticing that their energy bill was very high each month. They decided they wanted to reduce their carbon footprint while also saving money. THey gave Carolina Energy Conservation a call and set up a Solar 101. After their system was installed, they started seeing savings! Not only are they saving each month with solar, but they also qualified for 55% total tax credits for going solar! 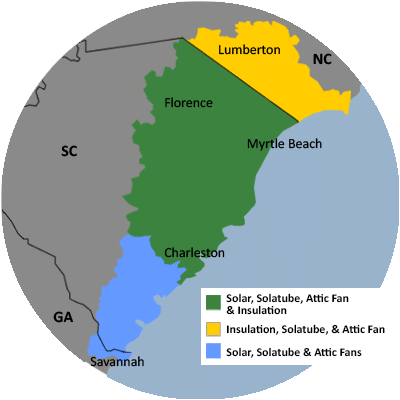 For a FREE no-obligation estimate in Andrews, SC, please fill out the form to the right and Carolina Energy Conservation will contact you shortly. I am interested in your in-home assessment program to identify air leaks. The crawlspace and floor of the house are uninsulated. Was hoping to get an estimate for getting the crawlspace insulated. Looking for an estimate for spray foam insulation on a 2000 square foot house. We specialize in a variety of services aimed to lessen your home's carbon footprint and save energy and money each month! We offer it all, from air sealing to ductwork to insulation and HVAC services in Andrews, SC. For a FREE, no-obligation services estimate in Andrews, SC, you'll also receive a free copy of "Saving Energy and Money at Home," a great book to use as you begin to create a more comfortable, healthy, and energy efficient home! Our state of the art solar panels go up with ease and without structal modifications to your home.